Still seeking the perfect holiday gift for that YA fiction-lover in your life? 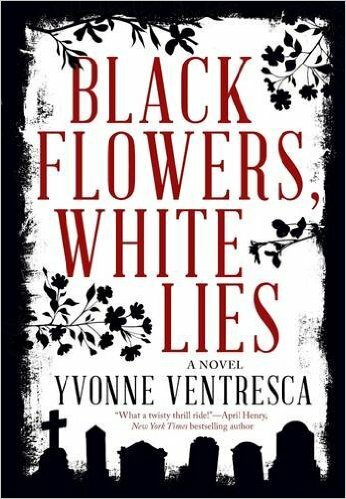 Author Yvonne Ventresca‘s sophomore novel Black Flowers, White Lies may just fit the bill. Black Flowers, White Lies follows cat-loving, superstitious protagonist Ella, a teenager whose strong connection to her father endures despite the fact that he died before her birth. When strange things start happening in Ella’s life, you can’t help but wonder: Is her father sending warnings from the afterlife? Are her family’s hereditary psychiatric problems slowly claiming their latest victim? Or is there an earthlier explanation? I prefer YA because it’s such an interesting age to write for, and because the teenage years are filled with both potential and uncertainty. In terms of themes, writing a novel is a long process for me, so I pick topics that I find intrinsically fascinating. As morbid as it sounds, the idea of a deadly contagious outbreak, for example, is a topic that can create a lot of interesting scenarios. Would we help our neighbors in that situation, or would we focus on self-preservation? I wanted to explore that idea in ‘Pandemic,’ and have the survival story exacerbated by the fact that the main character is emotionally traumatized before the disaster occurs. In ‘Black Flowers, White Lies,’ the idea of our ordinary world being disrupted by mysterious events was also of interest. How solid is our perception of reality, and how can that possibly change? Both of my novels feature characters who are forced to draw on an inner resolve they didn’t know they had. I think people are often stronger than they realize. You can read my full interview with Yvonne Ventresca at Carousel, a Skyhorse Publishing Book Blog.